The mining industry is heading into uncharted territory. New technology is emerging left and right, providing the industry with exciting new opportunities. However, this new technology also brings a great deal of uncertainty to an industry that has, at times, been stuck in its ways. In reality, there are only a few barriers stopping any company from achieving a full digital transformation and seeing production skyrocket. The issue with much of the emerging software in the mining industry is the lack of opportunity to “try before you buy.” Companies need to be able to validate new products, and their ability to implement into their mines, before they are able to purchase them with confidence. They need to see them in action, not in a lab, not on paper. They need to see them in a mine. Solution – Search for products that offer trials. Companies need to see how new software applies to their mines. They can then make an informed decision with confidence. groundHog is one such piece of software. groundHog is a mobile fleet management system optimized for underground mines. Mining executives need to ensure they are doing business with a reliable company. Does the vendor have other high-profile clients? Do they appear to reliable and have intent to be around for the long haul? Are they going to be around to provide support for your new software? These are all questions that are important to mines and they need them before implementing new software. Solution – Seek out companies that have a good reputation, reliable customer support, and a number of other clients. This ensures that they are healthy enough as a business to provide the necessary support for companies throughout the lifespan of their software. 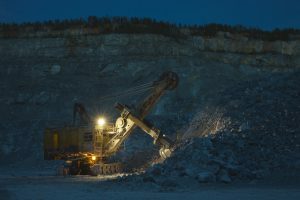 In short, new tech can be intimidating but it is essential to the future of the mining industry. Competition is tougher than ever and companies that can’t take the leap will pay the price. Click here to find out about more about rapidBizApps and our software solutions.